Here's a first for AWNT, a Nintendo Switch game review! 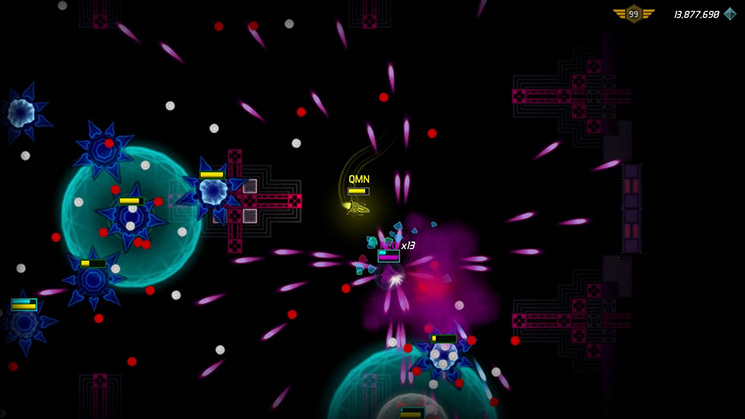 Aperion Cyberstorm is a twin stick "bullet hell" shooter in which you fight off an endless stream of neon colored enemies with your equally endless stream of bullets. While the genre is an old one, Aperion attempts to mix up by giving the player lots of customization in terms of ships and attack patterns. You can also play with up to 4 other friends if you have the controllers handy. 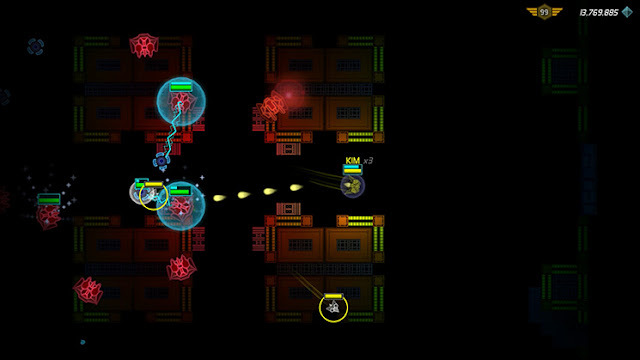 Aperion Cyberstorm's campaign sends you through a long series of rooms in which you fight off a huge number of enemies before moving on to the next room and doing the same thing again. At the end of each "world" you fight a massive boss. There's some sort of story tying it all together, but it's difficult to follow and not all that interesting. What you're here for is blasting a bunch of aliens and spaceships, and that's exactly what you will get a heaping helping of. One of the game's best strengths is the wide variety of enemy mechanics you will have to deal with. 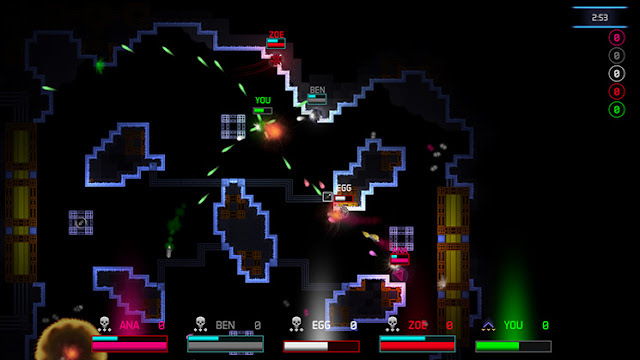 You'll find yourself adapting constantly from room to room as new enemies types appear in different combinations. 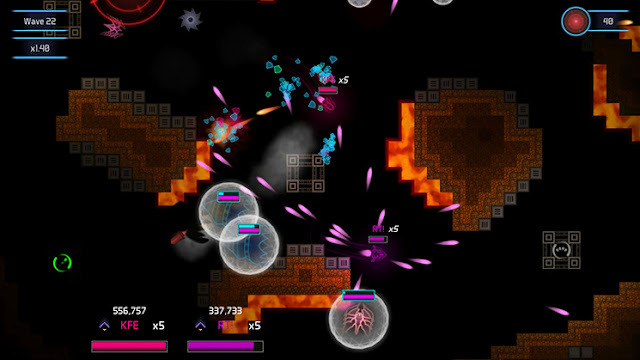 There are big tough enemies, super fast little ones, enemies that shield others from damage, and enemies that blow up and turn into more ships. You'll also have to deal with the occasional environmental hazard like slippery ice or burning lava. As you fight enemies and explore the occasional nooks and crannies of the world, you'll gain experience, gems, and upgrades. At certain intervals you'll be able to customize your setup a bit. There are a bunch of different ships, each with slightly different stats and shooting patterns. You can also pick from among several power up abilities, like a super rapid fire cannon or wide shotgun blast. These power-ups recharge often enough that you can use them multiple times in each room, while also picking up random temporary boosts (like freezing or burning damage) that can be found floating around mid-combat. Ultimately, I couldn't find that any one strategy was particularly effective compared to another, the customization is mostly up to your personal preference. The gems that you collect from destroying enemies and exploring the world can be used to upgrade your special powers, letting you give a boost to any of the ones that you particularly like. These upgrades make the power-up last longer and recharge faster, something you will definitely need as the game progresses and you find yourself facing meaner and more numerous enemies. Although the mechanics of the game clearly have a lot of work and love behind them, the art design and sound are a bit less impressive. I didn't really enjoy how the entire game seems to take place in a series of caves, with black being the predominate color on screen at all times. Despite everything in the game being some flavor of neon, it always feels way too dark for my taste. The sound effects, something you will hear non-stop in this sort of game, could have used some more work. Many of them feel one notch removed from the original Asteroid. The music, on the other hand, was enjoyable throughout the game. While the game has solid mechanics and gameplay, none of it is particularly original or inspired. The game can also get a bit repetitive, as there are only a few rooms with an objective other than killing wave after wave of enemies. You've probably played something exactly like this before, and it's probably been done better and with more style. However, for the low price point you will get many hours of engaging gameplay. Although the game is available on PC, I would strongly recommend getting the Switch version if you can, it's a perfect game for chilling on the couch and blasting away at limitless enemies. Aperion Cyberstorm is available on PC, Wii U, and the Switch.